In recent years, Uber, Lyft, Airbnb, TaskRabbit and similar businesses in the startup “shared economy” industry have become a growing part of the cultural vernacular. A local entrepreneur is hoping his startup business will follow a similar upward trajectory. Two years ago, the seed for Shaun Savage’s new on-demand business, GoShare, was planted out of frustration and, ultimately, inspiration. In the years leading up to the startup’s origins, Savage said he needed a truck one to two times each year to haul large items. The sporadic need was not enough to justify purchasing a truck, Savage said, but he knew he would be willing to pay someone to handle the task for him. GoShare has been compared to a truck variant of Uber and Lyft, but Savage said there are other disparities — the most notable being the overall business model. While Uber and Lyft exist to transport people, GoShare moves cargo, such as furniture, which cannot easily be relocated from point A to B. Savage, who describes himself as “a sales and marketing guy,” is quick to point out the expertise of the technology professionals that brought GoShare to the marketplace — a hired tech team launched the mobile app that serves as GoShare’s lifeblood. The GoShare app gives users a number of options, including the ability to choose between a pickup truck, van or an SUV, and drivers offer their vehicles in close proximity. The service is available for delivering, hauling, moving, shipping and towing large items. In most instances, Savage said a driver will arrive at a customer’s home in 30 to 45 minutes from the moment the request is placed through the app. 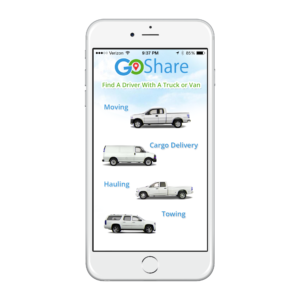 GoShare, Savage said, is touted as a more cost-effective and convenient alternative to traditional truck rental companies. Although it has differences to Uber, Lyft and others in the sharing economy space, GoShare does have one common thread: its reliance on independent contractors. Noting the 1,500 applicants who have already put their names in, Savage said GoShare has not experienced a shortage of qualified drivers. While Savage’s vision for GoShare sprung to life independently, the company gained its footing within EvoNexus — described as San Diego’s only fully pro-bono startup business incubator — located at 101 W. Broadway, in the heart of Downtown. Savage and other leaders within GoShare officially graduated from EvoNexus’ incubator program a year ago. In addition to receiving such perks as free office space, the graduates were able to glean experts’ advice on some of the fundamentals involved in a successful business launch. According to officials at EvoNexus, they only approve a small handful of entrepreneurs’ applications each year. Savage attempted to enter the program in 2014 as he fleshed out GoShare’s business plan, but he was not officially accepted until a year later. In its seven years of providing expertise to incubator businesses, EvoNexus’ leaders like to share the high success rate of their graduates. An estimated 88 percent of all graduates remain in business to this day. In a statement, co-founder and CEO Rory Moore said the rigor baked into the EvoNexus program is part of the reason graduating businesses advance to further success. “Since inception, EvoNexus has matured considerably in the area of attracting more social entrepreneurs, more social teams and startups that have significant inventions,” Moore said. 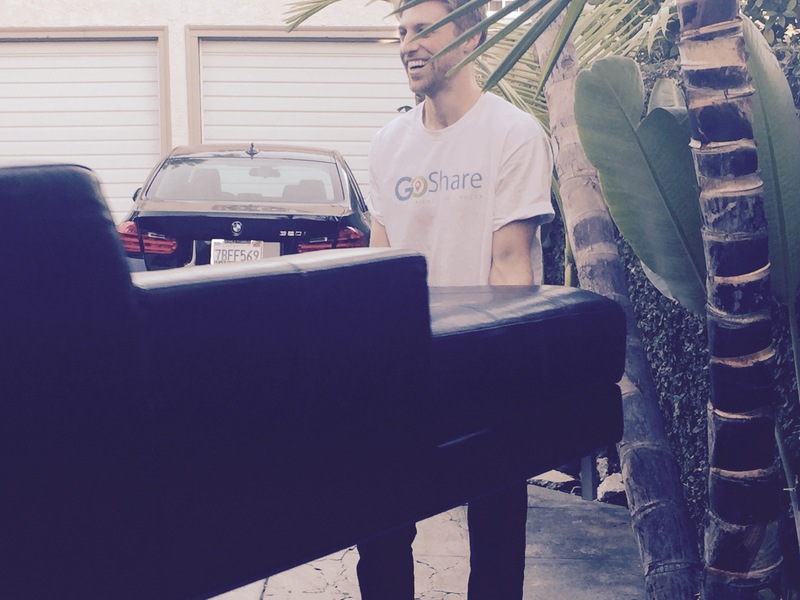 GoShare is headquartered Downtown and available in most areas of San Diego County. It is also available in portions of Los Angeles, Philadelphia and communities within New Jersey. The app will also soon be available in Atlanta, but Savage said he plans to keep his “perch” in San Diego. As he looks to the maturation of his own business, Savage said he sees boundless possibilities and eventually plans to have the app available to users all across the U.S.
For more information on GoShare, visit goshare.co or call 619-326-4404. —Dave Fidlin is a freelance journalist with a special affinity for San Diego and its people. Contact him at dave.fidlin@thinkpost.net.